Ever practiced guitar for many hours but achieved so little progress? (Have you wondered why you can’t get results in your playing as fast as you want even when you manage to stick to a daily guitar practice routine? After many years of helping thousands of guitarists to master their guitar playing, I found that making rapid improvement on guitar is mostly determined by your ability to focus on and optimize the 4 critical guitar practice elements that always lead to great guitar playing. 1. Guitarists who believe that practice routines are boring and ineffective (these guitar players do not follow any kind of practice schedule). 2. Guitarists who endlessly search for a single practice schedule that will make them great guitar players. Both groups will continue to struggle to make progress due to fundamental misunderstanding of how practicing guitar works. The best guitar practice schedules for you are NOT boring nor restrictive. When designed correctly, guitar practice schedules are BOTH highly effective and lots of fun to follow because they are based on your guitar playing goals, practicing preferences and strengths and weaknesses. Here’s a secret (and the reason why guitar players in the 2nd group also fail to get big results from practicing): No matter how great a certain practice schedule is working for you now, it will NOT work forever! Why? As soon as your musical skills improve, your guitar practicing needs will change and evolve. You must have a system for automatically, consistently and accurately adjusting your practice schedules to your most current needs, challenges and goals. To learn how to do this in the easiest and most effective way possible, read this page about the most effective practice schedules for guitar. Even if you have the most effective guitar practice schedules, your practicing will not making you a great guitar player if you practice using low quality materials such as (most) videos from YouTube or lessons from unqualified guitar teachers. Without the highest quality practice materials available, you will never start getting better at guitar (not to mention the wasted time and frustration that comes from not getting results). 1. The best guitar practice items are never taught to you in isolation. Instead, they need to be organized into a well thought-out and proven strategy custom-designed specifically for you. (Now you know why this rules out the vast majority of random/disorganized content you can find on YouTube and most guitar lesson websites). 2. The materials you work on must be given to you by an expert guitar teacher. Hint: don’t judge a guitar teacher by his/her playing skill level. Instead, look at the skill level his/her students have achieved. The more guitar students a teacher has consistently turned into great players, the more faith you can put into the practice materials you receive from him/her. Even if you spend lots of time practicing guitar, you will not get anywhere if you are practicing guitar mindlessly. Your mind is the most important thing for getting better at guitar. If you are unfocused or getting distracted very easily while you practice, you are NOT actually practicing - you are just playing guitar. Playing guitar is fun to do, but it doesn't help you make any progress in your musical skills. Think of your focus during guitar practice like a magnifying glass: if you concentrate the sunlight through it long enough, you can set something on fire. On the other hand, if you expand the sunlight to cover a larger area, it loses its power due to lack of focus. That is exactly how your mind works and how powerful a focused state of mind is. The good news is that once you understand how to practice guitar effectively and intelligently, you can make a lot of progress even with limited guitar practice time. Consistently effective practicing means more than merely “practicing your guitar every day” (that part is obvious). Most importantly, it refers to consistently implementing ALL elements of highly effective guitar practice. It’s the compounded effect of CONSISTENT practicing done over the long term that is key to becoming a great guitar player. The key to remaining consistent in your practicing is to never lose sight of the reasons why you practice guitar in the first place - to reach your specific goals and become a great guitarist and musician. Keep reminding yourself of how awesome you’ll feel when you finally become the guitar player you’ve always dreamed of becoming and you will find yourself wanting to take whatever steps are required to achieve this result. Each of these 4 items reinforce each other to create what I call the “Guitar Playing Progress Loop”. 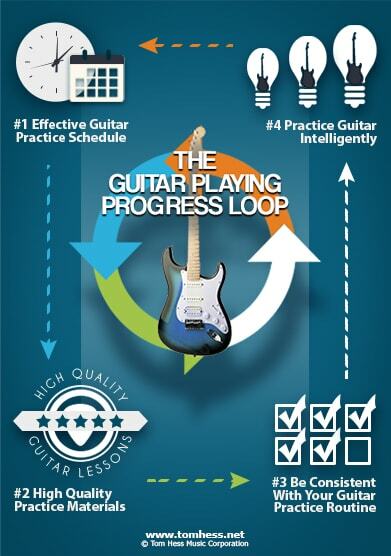 To make the fastest progress possible in your guitar playing, strengthen and improve each part of the loop. When you do, this will have a compounded effect upon the other aspects of your practicing and will push you forward to become the guitar player you desire to be. To test how effective your current guitar practice routines are, take this guitar practice test. Discover the best way to practice guitar to become a better guitar player much faster.